IMGP0810, originally uploaded by Mic2006. 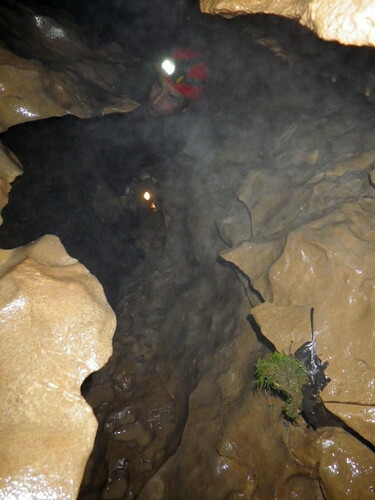 This is JC as he and I wiggled our way on deeper into this unexplored Ontario cave system. We have a mapping planned. Some time soon we should be able to provide more definite dimensions. 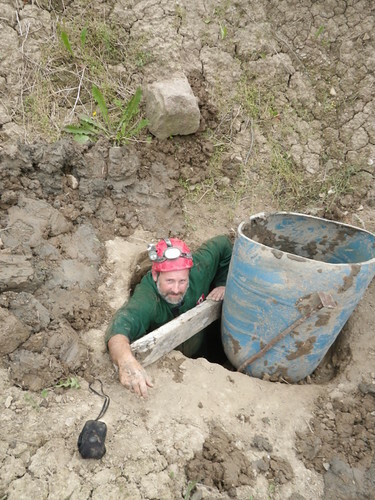 We finished the day’s exploration with (For me) a difficult crawl from our excavation hole. With a narrow tube such as the one down which we dropped down into the main tunnel, it does not make for an easy exit. Down below there is nothing to put your feet on, and higher up, the surface is just at that spot where you are unable to lift yourself. I struggled for some time with JC offering to help pull. Anyway I am now suffering from a multitude of delayed injuries including weird rashes, tiredness and bruises that I don’t remember getting. I was sitting at my desk yesterday and discovered a chafing on my belly – not entirely explained by the friction of rubbing against the keyboard. I had 11 hours sleep last night and I seem to be on the mend. 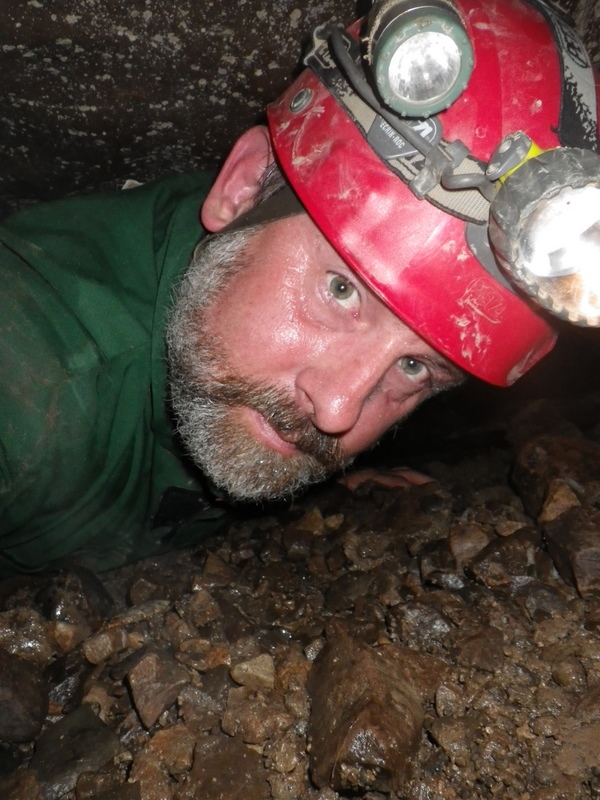 Caving gives me both a mental and physical thrashing. This exploration of virgin tunnel keeps me on this mental overdrive that I suspect is costly for several days after. Check out JC’s pictures of Wasteland Waterway here – in particular the flowstone that looks very much like melted cheese. Our aim today had been to reach the underside of a sink some 200 surface meters as the crow flies from the “Blue Barrel sink”. The initial squeeze beyond the blue barrel sink seemed tighter than I remembered it last visit, but beyond that, as expected, the tunnels opened up well beyond our most hopeful expectations. The above picture was at the squeeze just beyond “Blue Barrel Sink”. JC and I followed into a vadose trench where the roof was soon well above our heads. We left a decorated upper level behind (with it’s own exploration possibilities) and found ourselves following a zig zag course downward through sheets of rock and layers deeply pitted with scallops. Today’s exploration ended in a shallow pool with 3 choices of tunnel moving forward. I suspect that a rightward leading tunnel could well underlie the sink for which we had been heading – but then it’s just purely speculation (well not entirely). We must already be quite deep beneath the surface and confirmation as to this passage’s eventual termination would require a stoop walk along the said passage which at first glance looks very jagged – though to it’s credit it is a little above the trunk passage in height so possibly a feeder passage leading from the suspected sink. As an Ontario cave this one ranks up there with other more impressive local caves – who knows how big it will eventually get, it certainly blows a healthy draft. So far the formations have not quite matched those of Spanky’s Paradise, but they come a close second. This cave is certainly deeper than most Ontario caves (and I have been in most Ontario caves that are known to the caving community). As a straight line tunnel – thus far only branching now, it is definitely impressive for Ontario. IMGP0851, originally uploaded by Mic2006. As possibly mentioned before I went to Mexico (Tulum) and having experienced some of their truly incredible caves I had said that JC and I were intending to dig out the blue barrel sink and enter Wasteland Water way partway along – in particular after the wet crawl through the elliptical wormhole. Admittedly we liked the idea of a bale-out spot in case we were trapped by flood. Further upstream the water reaches the roof when it rains and that was always on our mind while caving. This new entry way gives some peace of mind – we still have airspace at this point pictured above. Worst case scenario, we are gonna survive a flash flood – that is important to the continuance of my caving enjoyment. On the point of Mexico caves on the Yucatan, they are incredibly well decorated, but by my observations, the decorations seem to be composed of rough, puffy calcite and in cross section, multi colored as could be seen in broken stalactites. More exciting stuff on that and my disappointing trip to Rio Secreto (soon). IMGP0250, originally uploaded by Mic2006. Along the outer edges of the Dos Ojos Cenote divers leave the light and enter into the unforgiving world of cave diving. Following a line into the Mayan spirit-world it is traditional for a shaman to offer a blessing with a bowl of smoking copal. there was no such practice here, divers suit up in their scores to explore the Yucatan from beneath. 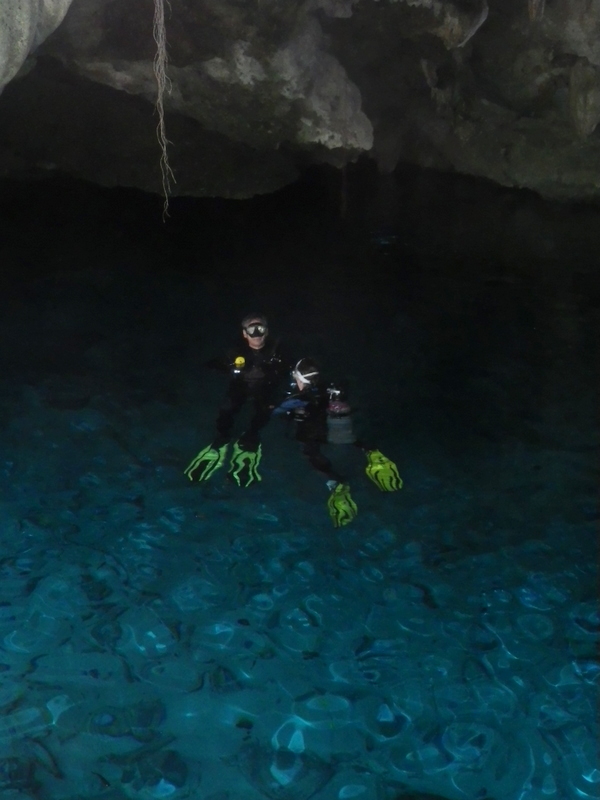 Dos Ojos is considered a beginner cave dive location, but there are plenty of other nearby underwater tunnels. Sac Aktun is situated within a short drive of this system and it is to date the longest explored underwater tunnel system in the world. 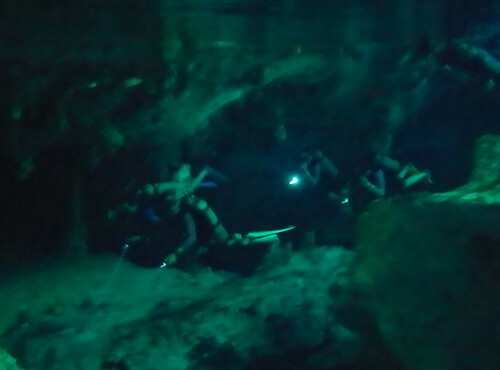 Other local cave dive locations are Yaax-Mul which is just south of Dos Ojos and Chac-Mool which is close as well. I took this picture with my new waterproof camera that I had bought to photograph our newly discovered Ontario cave – “Wasteland waterway” – sadly it’s hard to keep still and the picture was a little blurry. JC and I will probably be back to Wasteland Waterway by next weekend – weather permitting. Admittedly I have another book in progress on Ontario caves and their exploration, but check out Tamarindo; Crooked times in Costa Rica – it was my last book – a work of fiction with some pretty weird characters. The surface of the Yucatan – especially the more northern area along the edges of an ancient meteor impact crater is dotted with deep blue pools of water. They were both of physical and cultural value to the Mayans. As there is little surface running water on the Yucatan, towns grew up around these wells. Culturally, the cenote and its accompanying underground tunnels represented the entrance to Xibalba (shi-bal-ba) the Mayan underworld from where life was both taken and delivered. This past week I had the fortune to visit several underground destinations in the Yucatan and so the next few posts will be along the lines of relating something of that journey. The above picture is of Dos Ojos near Tulum. Maggie and I went snorkeling there and traveled above the water, beneath the rock between the two eyes (Ojos). It was a fantastic experience – more to follow.